Transitioning to winter is already hard enough – the shorter days, the cooler weather, the general feeling of exhaustion. Add the task of shopping smartly for the new season, and you’ve got yourself a full plate! But worry not – we’re here to give you a hand concerning the big transition. We’ve selected only the essentials – the pieces that keep you warm no matter what. 1. Cropped Trousers. More elegant than jeans, but still wearable any time of the day, cropped trousers are a must for the cold season. Pick trendy burgundy, and wear them with printed tops and masculine inspired shoes. 2. Knitted scarf. A sensitive neck asks for extra protection, and a knitted scarf is just that. Opt for a bohemian model, with fringes, or go for the circle scarf that’s all the rage on street style blogs. 3. Metallic gloves. Since it’s transitional weather we’re talking, you can still get away with cutout gloves. The best part of these is their metallic texture: it doesn’t get more futuristic or any cooler than that. 4. Ankle boots. Forget about sandals for a while, and welcome ankle boots into your wardrobe. You can wear them with skirts as well as with trousers or leggings, never failing to look chic. 5. Wool skirt. A good, warm skirt is a staple in any woman’s wardrobe. If you want it printed, choose a classic style like gingham or polka dots, and keep the palette clean in black and white. Wear it with a button down and comfortable shoes for work, or pair it with a V-neck top and a statement necklace for a night out. 6. Over the knee socks. 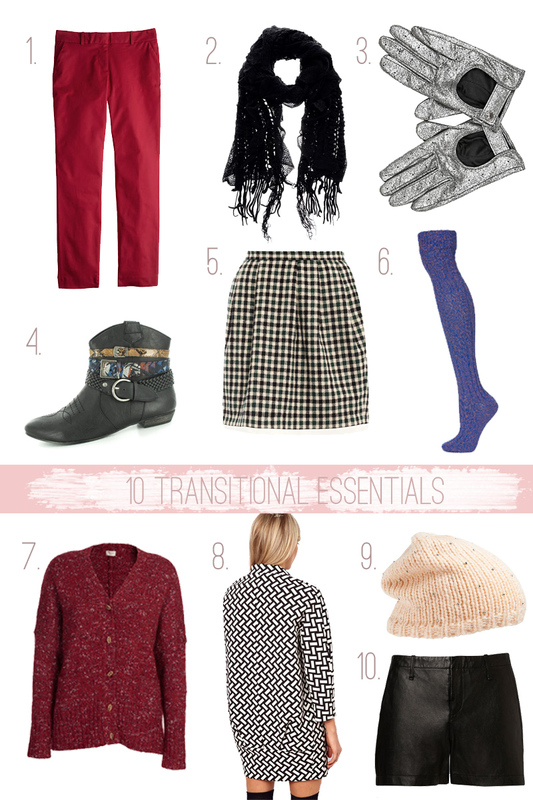 Hosiery is essential in cooler months! You can either wear tights or over the knee socks – both will hug your legs and keep them warm. How sweet would they look with a pair of low heel office shoes and a mini? 7. Mohair cardigan. Mohair is so cozy, you can’t be without it this winter! Opt for a cardigan rather than a jumper, as you wear it two ways – buttoned or not. Plus, you can take it off easily if, for example, your office is too hot. 8. Printed coat. We’re bored with plain coats! It’s such a pleasure to see some color and print on the streets in winter, so why not cheer yourself up? 9. Embellished beanie. A simple beanie is no longer enough. Crystals, studs, pearls and jewels have, in turn, graced the otherwise casual jersey fabric of the beanie. We find the silver beads on this one to be just enough bling! 10. Leather bottoms. Trousers, shorts or skirts, you need some leather bottoms this season! You already know that properties of the fabric are a perfect fit for winter, so just give it a go. They look best paired with delicate fabrics like chiffon or silk. This entry was posted in Fashion and tagged transitioning to winter, winter 2013, winter trends by moribrown. Bookmark the permalink.